The beach inspires melancholy and romance in all seasons, exciting visitors and inspiring artists. Watch the children playing in the ‘mini sea’ (shallow stretches of water on the beach, known as ‘kimmetje’ to the residents of Noordwijk), take pictures of the cool surfers and stay until the sea-gulls come to pick the crumbs out of the sand and the sun turns orange and sinks into the sea. 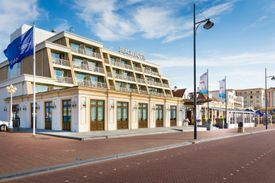 Noordwijk is easily accessible, as it is centrally situated in the Randstad area, with numerous routes to the nearby A44 motorway. There is plenty of parking space near the beach and shopping areas. 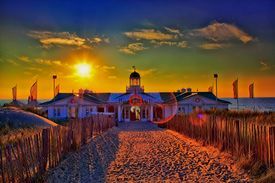 Noordwijk has 18 beach clubs & pavillions, 7 are open all year round. Noordwijk aan Zee has a variety of beaches: off the north and south boulevards, Duindamseslag and Langevelderslag. Also dogs are welcome at the beach of Noordwijk. 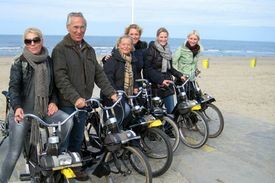 Free transport from and to the Beach of Noordwijk. The Blue Flag is awarded annually to seaside resorts that have clean, environmentally-friendly, safe swimming areas. It is an internationally recognised symbol of first-rate beaches. The following aspects are asessed: the quality of the swimming water, sanitary facilities, facilities for the handicapped and the quality of the beach. Noordwijk meets the strict conditions every year. 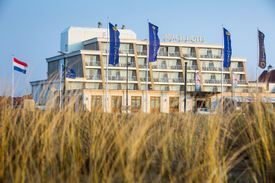 Noordwijk has been awarded the European Quality Coast mark. Which is awarded to international coastal sites, recognising the high standards of coastal and beach management in the areas of tourism and the environment, the conservation of nature and landscape, identity and cultural heritage. 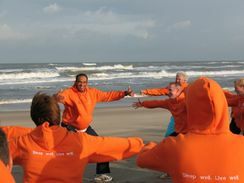 Noordwijk also works closely with the Foundation 'Nederland Schoon' in projects such as MyBeach. Swimming Only swim on incoming tides (flow), never on outgoing tides (ebb), see Tides schedule 2018. 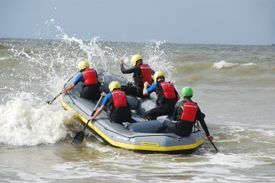 During summertime lifeguards and a rescue service are in operation at the seaside resorts. Please take note of their instructions: in some areas warning notices are in place which could save your life. Barbecues Barbecues and fires are prohibited on the beach, but for those who want to eat barbecued meat, many of the beach pavilions have their own barbecue facilities. Fast vessels All fast vessels (i.e. water scooters and jet skis) are prohibited on the beach. No vessels are allowed within 300 sea metres of the beach. 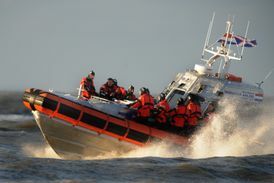 You can find more information at the municipality of Noordwijk. Horses on the beach You can enter the beach of Noordwijk with a horse from the exits 22, 23, 25 and 26 the entire year. During the bathing season, from the 1st of June until the 31st of August, it is forbidden to ride a horse from exit 27 at beach post 74.000 until 75.000. In the urban area you need a permit to ride a horse. 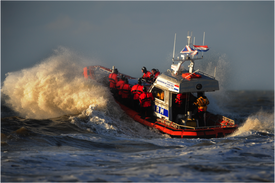 You can find more information at the municipality of Noordwijk. - Just to the south of the Duindamse Slag, between beach post numbers 78.000 and 79.500. Sanitary facilities, a beach pavilion and a bicycle stand are all located at the beach turning (400m distance). - Just to the north of the Langevelder Slag, between beach post numbers 73.000 and 74.000. This is reasonably accessible by bus. A secure bicycle stand and parking facilities are available at the beach pavilions, 700 m from the south border. 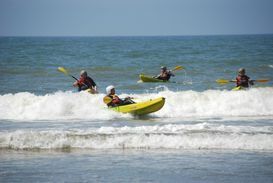 From May 1st to December 15th the charity Outdoor4Disabled organises beach rides along the water line for people with disabilities. Rides are possible on Monday to Friday and last approximately one hour. Reserve through telephone +31 (0)6 - 46 37 22 08.